The First Interstate Greater Wall Area Fund recently awarded the first $15,000 of a $25,000 grant, to be paid out over a three year period. This grant is for cement/flatwork for the Wall School Athletic Complex concessions and restroom facility. 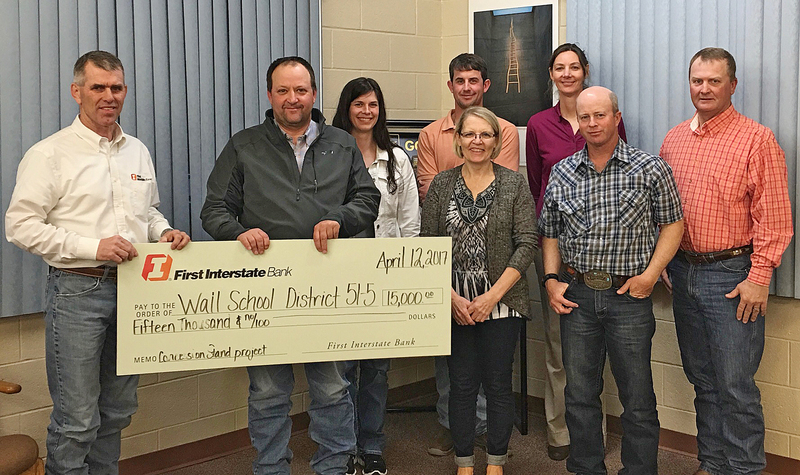 The Wall School Board of Education accepted the check, presented by Brett Blasius, manager of First Interstate Bank Wall/New Underwood. Pictured from left: FIB Wall manager, Brett Blasius, and school board members Scot Eisenbraun, Elaine Simons, Carolynn Anderson, Ryan Kjerstad, Jill Leonard, Spencer Cordes and Kevin Bielmaier.